On September 25, in the Miyagi district of Chatan - solar panels of Nissin Holdings Co., Ltd., that officially launched a renewable-energy project using feed-in tariffs. On September 25, Nissin Holdings Co., Ltd. officially launched a renewable-energy project using feed-in tariffs. The company has been working on projects to sell solar generated electricity by leasing the roofs of residential housings, and will sell all of the electricity to the Okinawa Electric Power Company. Nissin Holdings started electric power generation utilizing six houses equipped with solar panels in the Miyagi district of Chatan and can currently generate 0.08 kilowatts. The electricity generated is fed into the grid run by the Okinawa Electric Power Company. The company leased roofs of rented accommodation used by Americans living in Okinawa, and pays five to ten percent of the electricity sold as the rent to the tenants. 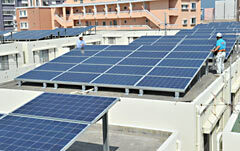 Nissin Holdings installs one set of 42 solar panels capable of generating 240 kilowatts on each of the leased roofs. The company has set these panels up on 15 properties and plans to start generating power from each of them in sequence. Besides this electricity, the company plans to build a 300-kilowatt photovoltaic solar generating facility, and will sell all of the electricity generated at a fixed price. Nissin hopes to set up panels on 100 houses in the coming year, which will generate one megawatt of photovoltaic solar power for the district. The Ministry of Economy, Trade and Industry certified 75 cases of trading in electricity in Okinawa during the period from July 1, when the feed-in tariff started, through to the end of August. All of them involved solar generated electricity producing more than ten kilowatts and one of them produced more than one megawatt of electricity.